The fear of becoming destitute and so having to enter the 'House of Industry', or workhouse, was a shadow over the lives of many people until the 1930's. Tewkesbury's House of Industry on Holm Hill featured in maps of the town in the nineteenth century, as it had been built in 1796, and then extended to accommodate a larger number of paupers when surrounding parishes in the Poor Law Union had to send their poor to Tewkesbury, under the terms of the infamous Poor Law Amendment Act of 1834. Locals were not slow to nickname it the 'Bastille', after the prison in the French capital, which was very much in the news at the time when Tewkesbury's was being built! 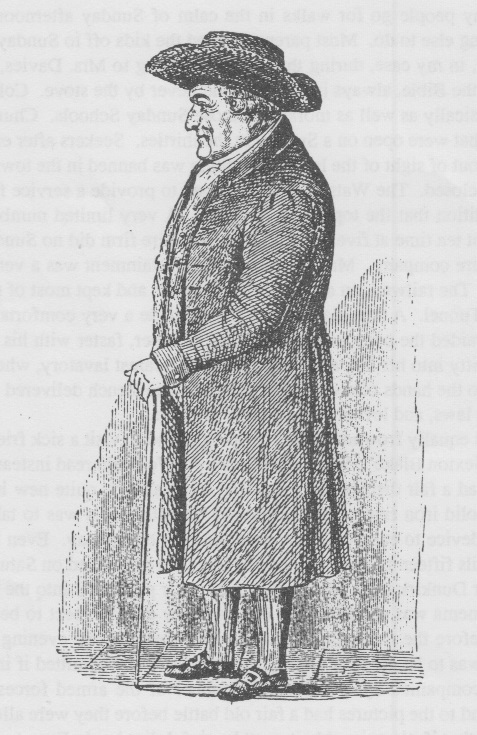 The worthy Quaker gentleman, Moses Goodere, who travelled to London in 1792 to obtain the permission of the Committee of the House of Commons for an Act to establish a workhouse here for the better relief and enjoyment of the poor' was subjected to much harassment from the 'lower orders' in the town. The Poor Law Act had hoped to put an end to the high demands on ratepayers caused by the system of giving money to those needing assistance, while they stayed in their own homes. It was hoped to deter the majority of claimants by ruling that no 'outdoor relief' should be given except in kind, i.e. in bread, coal or medical supplies. Conditions in the workhouse were to be a deterrent by being worse than anything the workers would experience outside the establishments. In view of this requirement by the central government, one might have expected that the support of claimants 'on the parish' would have ceased by 1835. How far, in fact, did the Tewkesbury Guardians of the Poor and Board of Health follow the directive? They certainly found that savings were made by gathering all the paupers of the area into one central workhouse instead of placing them in several smaller establishments. (This has a twentieth century ring to it!) However, it became apparent that it was more costly to provide complete board and lodging for a family inside the walls of the workhouse than to allow some help for them under their own roof. 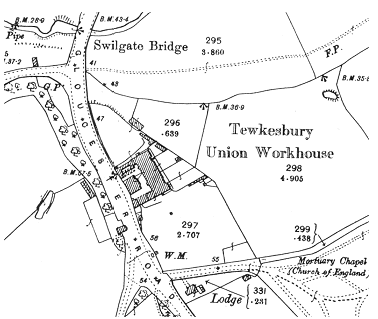 Bennett published the accounts of the workhouse in the Tewkesbury Register. In the Autumn quarter of 1837, for example, there were 78 inmates, maintained at a cost of £105.12s.10d., and 365 'outdoor paupers' who were helped for E169.7s.9d.. Administration costs were £92.16s.7d., and some loans were advanced, costing £21.8s.4d.. The Minute Books of the Board of Guardians and the Board of Health give some examples of cases. Aid sometimes took the form of loans. In December 1836 a loan of thirty shillings was made to a Tewkesbury man with a wife and five children to enable him to buy furniture. In June 1838 a loan of ten shillings was sanctioned for Richard Sandilands of Tewkesbury to buy rods 'with which to follow his employment of basket-maker'. In the same year Edwin Edgeworth was given a loan of seven pounds to buy a cart. Moses Harris had injured a limb, and a certificate proved him to be incapable of work. 'The family are in great distress, and have not bread for a poultice necessary to the injured limb.' The Guardians ordered that he should be allowed a shilling in meat and six loaves of bread. John Weaver's wife was dangerously ill with 'typhus fever'. The Medical Officer certified that she should be supplied with a change of linen, and with wine (often prescribed as a restorative), tea and sugar. The linen cost 5/10d. and the provisions 5/6d. Joel Mowbray of Bredon had 'English cholera' and was allowed meat and two loaves of bread. Isaac Purser, with a wife and seven children, from general debility is incapable of attending to his employment regularly'. During his illness he was to have a shilling's worth of meat and eight loaves of bread every week. In 1841 Samuel Hughes, an able-bodied man of Hasfield, had broken his leg. While he was in Worcester Infirmary his wife and five children were to be given two shillings and five loaves of bread each week. John Devereaux of Ashchurch had a whitlow on his thumb which prevented him working, and was allowed relief. These records are also useful for the study of public health, as they list, for example, ten cases of smallpox in children in Tewkesbury between December 1840 and February 1841. The Guardians could be humane, as is shown by their treatment of Elizabeth Vale, a widow of Kemerton. In 1843 she was given special permission for non-resident relief, because if she and her children went into the workhouse they would not be able to go to Kemerton school, where they were receiving instruction. At this time paupers were deemed worthy of respect, as is shown by the Board's serious consideration of a complaint made about Dr. Tunnicliff, who visited a young woman whose family were on outdoor relief. He examined her without the presence of another female, which greatly shocked her mother, who complained to the authorities. The doctor was exonerated from blame, but was advised that in future he should ensure the presence of another female when making such examinations. The deputation proposed that the men should be continued in employment under their respective employers, and that the Union (local poor law authority) should bear the cost of employing them. This was a contrast to the complaints of high rates, which had been heard from ratepayers some years earlier, and which had led to the 1834 Poor Law Amendment Act. 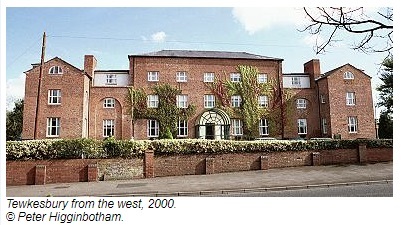 The Commissioners advised the Tewkesbury Guardians that 'this could not be done under the present laws'. All the Guardians could do was issue a statement regretting the distress of the district and assuring the ratepayers that they would pay due attention to any case of distress that came before them. In June that year they were told by the Commissioners that the Workhouse could contain no more than 350 inmates, serving all the parishes in the Union, so other forms of help would have to be used. In the quarter from June to September 1842 there had been 169 persons in the workhouse, at a cost of £194, and 1,033 'out-paupers', costing 231. For the corresponding period in the previous year, the figures had been £100 and £669 respectively. The Chairman of the Guardians at this time was Joseph Longmore, Esq. of the Mythe; John Moore, the auctioneer, was vice-chairman. Bennett, the bookseller and publisher, was well-placed to report on the circumstances since he was himself a Guardian, the others being Joseph Higwell, gardener, of the Oldbury and Joseph Smith, farmer, of Lincoln Green. In his classic book on The Workhouse', Norman Longmate gives descriptions of how applicants for relief in many areas were discouraged by the draconian attitude of the Relieving Officer. Even at the end of the nineteenth century and later respectable applicants were humiliated when desperate enough to apply for relief from 'the parish'. The formal records available to us do not give any clues to this aspect of the situation in Tewkesbury. Public concern for the poor in winter in the early 1840's had caused a charitable fund to be set up, initiated by the local clergy, to buy coal to be sold to the needy at a greatly reduced price. 7,579 tickets for bread, groceries and meat were also distributed. Some 865 families, totalling 3,450 people, benefited from this fund, which in 1841 amounted to £385.6s.0d. For the corresponding period the Poor Law Union spent £166 on inmates of the workhouse, and £256 on outdoor relief for the whole of the Union. As this was only one of the charities which helped the inhabitants of the borough, it can be seen that more was given freely to help the poor than the public system provided. Individuals such as John Terrett or Thomas Caddick used to give £40 or £50 annually, and considerable time was given to public service by the privileged classes of society. The Minute Books of the Tewkesbury Guardians of the Poor are listed in the Gloucester Records Office under G/TEW, and Bennett's Yearly Register and Magazine for the years 1830-49 are in the reference section of Tewkesbury Library. These glimpses of the administration of the system of poor relief outside the workhouse bring to life the everyday problems of ordinary people in the early 1840's. The Tewkesbury Poor Law Union 1835-43 consisted of Tewkesbury, Walton Cardiff, Ashchurch, Oxenton, Woolstone, Tredington, Elmstone Hardwick, Boddington, Leigh, Deerhurst, Kemerton, Twyning, Stoke Orchard, Bredon, Norton-by-Bredon, Overbury, Teddington, Conderton, Forthampton, Pendock, Chaceley, Tirley and Hasfield. The Tewkesbury Union proved to be too large, so after 1843 Forthampton, Pendock, Chaceley, Tirley and Hasfield were removed to form the new 'Forthampton District'.